The death of Yash Chopra led to a surge of online film canonizing that seemingly celebrated his populist work at the expense of creative flourishes such as Mashaal and it is a film that is often overlooked in his oeuvre. I’m not entirely sure or convinced if Mashaal has been completely reclaimed from the past. However, I want to argue for its importance as one of Yash Chopra and screenwriter Javed Akhtar’s most ideologically complicated and realist works since the film’s prescient socio-political content hinted at the potential of Chopra’s wish to transcend the directorial persona and romantic style of cinema with which he had become synonymous after the commercial success of films such as Silsila and Kabhie Kabhie. 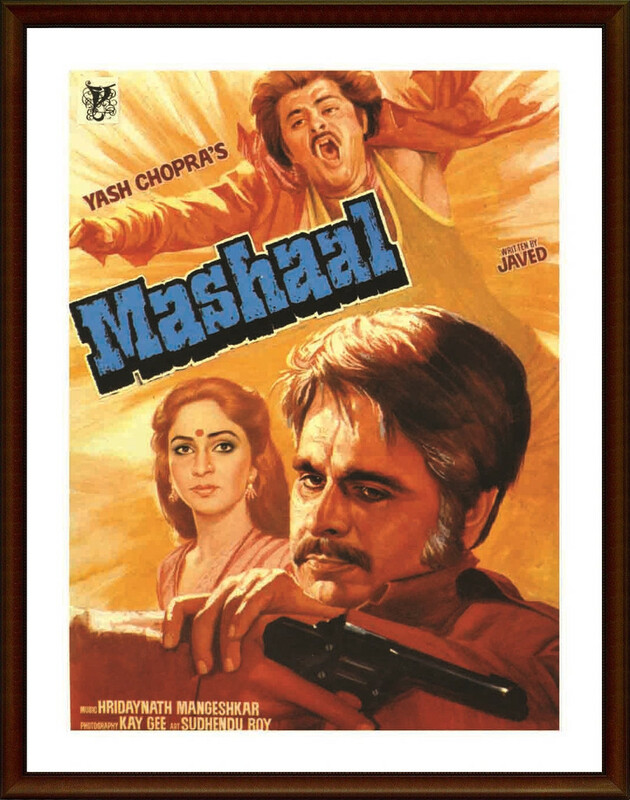 In an attempt to demonstrate both range as a filmmaker and also depart from the romanticism of his past films, Mashaal was in fact a return to the angry young man films of the 1970s with which Chopra had made his name. Shakti (1982) is generally regarded as the final film in the first cycle of angry young man films, lasting from 1973 to 1982, since it saw an end to a sustained creative script-writing partnership of Salim-Javed. Although Mashaal was released in 1984, Amitabh Bachchan had almost completely reinvented himself with the cinema of Manmohan Desai and this meant the angry young man persona had faded from the screens and resonated less with cinema audiences. Perhaps this explains why Mashaal is never really discussed in such terms since its release in 1984 meant it was more of an anomaly and stand alone work rather than constituting part of a cycle of films. I’m hesitant to argue that Mashaal should be repositioned under such a category since it may interfere with the achievements of the film, unfairly attributing them to familiar criteria that have become strongly associated with the angry young man films. Nonetheless, the ideologies of Mashaal extend from the angry young man films since the involvement of scriptwriter Javed Akhtar is evident throughout the narrative of a crusading newspaper editor up against a powerful underworld don and politician. Mashaal was one of Javed Akhtar’s first solo projects after the break up with Salim Khan for which he wrote the story, dialogue and lyrics. The film is based on a well known Marathi play titled ‘Ashroonchi Zhali Phule’ (Tears That Turned into Flowers), which had previously been made into a film, Aanso Ban Gaye Phool (1969), with Ashok Kumar. It came of little surprise to me that the role of Raja (eventually played by Anil Kapoor in one his first roles) was originally written for Amitabh Bachchan. It was in fact first offered to Kamal Hassan who turned it down, claiming the role was secondary in comparison to that Vinod Kumar played by Dilip Kumar. While song and dance had become integral to the films of Yash Chopra, such spectacular elements were subordinate to Mashaal’s more realist tendencies. The role of a man who refuses to compromise his political integrity echoed a similar role Dilip Kumar had played in Shakti. However, unlike Shakti in which Dilip Kumar’s character of the honest incorruptible police officer never compromises his beliefs, Mashaal shows us a much darker and pessimistic representation of the middle class individual. Rather than simply posing the question about the loss of political integrity, we are shown at first hand the transformation that Vinod Kumar undergoes, leaving behind his past and becoming an underworld don. A key thematic is the role of the media especially the press industry in questioning the abuse of power. As part of a newspaper company Vinod Kumar is fired when he attempts to implicate S. K. Vardhan (Amrish Puri), a prominent politician with ties to the underworld. This construction of the middle class professional acting as a conduit for socio-political corruption echoes the anger of Vijay and similarly comes from a sub proletariat urban space of the bustee/slum. It is only when Vinod adopts an independent editorial policy and is free from institutional constraints is he finally able to speak freely and tell the truth about Vardhan’s corrupt dealings. However, such independence makes Vinod much more susceptible to attacks from Vardhan who acts with total impunity in his retributive actions, persecuting Vinod and eventually burning down his tiny print operation. Mashaal was made with Indira Gandhi still in power and Vardhan’s immunity could be seen as an extension of the state. In many ways, Vinod Kumar recalls most clearly the character of trade unionist Anand Verma from Deewaar, another man of political integrity, who is also coerced to compromise his beliefs. The story of Vinod Kumar is intertwined with that of Raja (Anil Kapoor) who comes to symbolise the slum and most politically the sub proletariat. The departure with Mashaal when compared to the first cycle of angry young man films starring Amitabh Bachchan as Vijay is the film’s concrete attempts to situate the representation of the sub proletariat in an authentic topographical depiction of the slums. Such an explicit connection between the sub proletariat and an appropriate space may in part have been influenced by the impact of Indian parallel cinema on mainstream films. Ideologically, it is within the slums that Vinod finds a new place in society since his rejection by the middle class seems to suggest that it is the underclass who refuse to judge him. Initially, Vinod is antagonised by a gang of youth led by Raja who are unemployed, impoverished and marginalised from mainstream society. Vinod’s intervention and subsequent rehabilitation of Raja does seem preposterous but the point being made here is certainly valid since Raja’s transformation from delinquent to reporter underlines the paramount role of education in helping to liberate an oppressed underclass. Whereas such an articulation of education as liberator is evident in the character of Ravi (Shashi Kapoor) in Deewaar, Raja’s elevation from the slums makes him more sympathetic unlike Ravi who as a police officer becomes an inadvertent extension of the state. 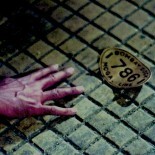 The sequence that is often discussed occurs midway through the film, taking place on the desolate streets of Bombay and witnessing Vinod trying desperately to flag down passing vehicles and screaming for help as his wife slowly dies on the footpath. Dilip Kumar is powerfully emotive in this sequence yet its immediacy comes not from Vinod’s cry for help but the reactionary silence from a heartless city, which is indifferent to such pain. Silence in the context of Indira Gandhi’s reign becomes politically demonstrative of a much wider malaise prevalent at the time. The most extreme transformation and one that can only happen within the realms of the Hindi melodrama is Vinod’s radical descent into the underworld. Like Vijay in Deewaar, it is only by transgressing certain norms and adopting the rules of a system based on individualism, destruction and capitalism does Vinod eventually reach his ultimate goal of confronting Vardhan. However, it is a transformation fraught with an incriminating bind from which Vinod cannot escape, complicating his status within the eyes of the audience. In my write-up to the film I have hopefully brought to light the ideological complexity of Mashaal and why in many ways it needs to be reclaimed as one of Yash Chopra’s most ambitious and best films. This entry was posted on October 14, 2014 by Omar Ahmed in Hindi Cinema, Indian CInema and tagged Anil Kapoor, Dilip Kumar, Indian Cinema, Melodrama, Political Cinema, Yash Raj.